In collaboration with the City of Melrose, the 39th Victorian Fair will include entertainment, performances, food, civic and nonprofit groups while showcasing Chamber businesses, local products and services. It will also feature the popular Big Ticket Raffle! This event will also continue to bring bring residents and families together for a day long celebration. A map of downtown parking lots. Consider biking to the Fair and use the bike valet service on East Foster Street provided by the Melrose Pedestrian and Bicycle Advisory Committee and Mass in Motion. Our generous chamber members have donated 15 amazing prizes to the Big Ticket Raffle. Buy your tickets for $10 each at Melrose Chamber members Miter Biter Frame Company, and Eastern Bank. Center Stage will once again feature music, singers, dancers, martial arts demos, and more will entertain people of all ages. The 2019 Line Up will be posted in June. Vendor move in instructions and booth locations will be posted on the Chamber website in early September! Volunteers are needed throughout the day to help set-up, assist with event operations and break down. Email Lauren Grymek at the Chamber if you would like to donate your time and have some fun! EMARC’s 24th annual 5K, sponsored by Marathon Sports will take place immediately before the Fair. Lace up for a great cause and learn more, including how to register, here. The Melrose Victorian Fair, hosted by the Melrose Chamber of Commerce, has been a major hometown event for 39 years. A day-long celebration, the Victorian Fair has become a beloved community tradition. Established in 1981, the Fair was intended to bring community attention to the city’s renovated downtown area. Newly installed Victorian lampposts highlight the prominent architecture and the rich, turn-of-the century heritage of Melrose. 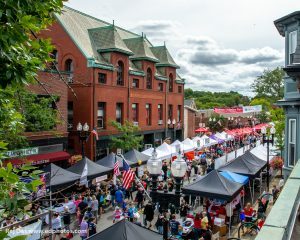 Each year, the Victorian Fair attracts thousands of people to Main Street in Melrose. Beginning at dawn on the morning of the Fair, volunteers transform downtown Melrose into a festive corridor. A two-block section of the bustling Main Street retail hub is closed to make way for the booths that line the street on both sides. Canopied booths greet the public with games, crafts, food and prizes. And, you will never leave the Victorian Fair hungry because local restaurants prepare tasty samplings for the crowds that roam the downtown area. Performance at Center Stage will entertain the crowds of all ages! The day’s gala celebration is brought to a grand climax with the drawing of the Chamber’s “Big Ticket Raffle” prizes. We hope to see you at the Fair!